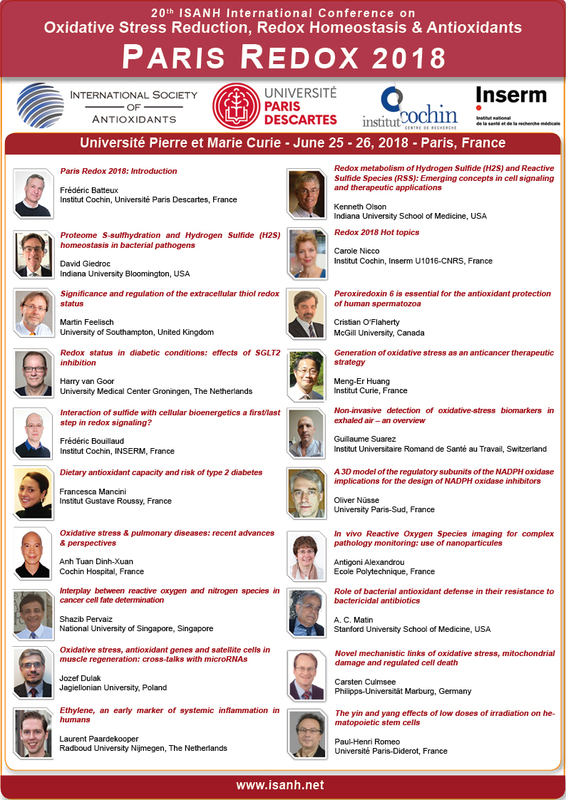 Paris Redox 2018 - the 20th International conference on Oxidative Stress Reduction, Redox Homeostasis and Antioxidants - was organized at the Université Pierre et Marie Curie (UPMC), Paris on June 25-26, 2018. This international congress gathered more than 250 academics and industrials representatives coming from 39 countries. Poster presentation about "The emerging role of the antioxidant uric acid in pancreatic β-cell viability"
Short oral presentation about "The novel TLDC proteins are neuroprotective against oxidative stress through modulation of the function of antioxidant and glycolytic enzymes" . Prof. van Goor gave a major talk about "Redox status in diabetic conditions: effects of SGLT2 inhibition"
To access the final program of Paris Redox 2018, please click here.